Goldyn et al. have just published a paper of which the abstract reads “[w]e are reporting the first locality of invasive giant African snail, Achatina (Lissachatina) fulica (Férussac, 1821) in the Ecuadorian Amazon. It was found present in 32 out of 50 urban sites studied. The abundance where present was relatively high when compared to literature from other parts of the world. The snails were found in aggregations, usually foraging — most often on dogs’ feces. Statistical analysis suggests a preference toward this source of alimentation. This is the first report of such preference in this species, which is highly significant considering the possible implications. Besides the threat posed by an invasive species to the invaluable ecosystems of the Amazon, the pathogens transferred by A. fulica combined with a high abundance of the species in an urban environment and its food preferences may constitute an important health hazard for local human populations”. This is, however, not the first published occurrence east of the Andes in Ecuador. The same authors have published this, and additional data, before in Folia Malacologica last year. If not an oversight by the reviewers and editor, this so-called “first locality” has to be blamed to the authors. But the fact as such (if we exclude the many Brazilian occurrences), unfortunately, was waiting just to happen. Hopefully the Ecuadorian authorities nowadays know how they should eradicate this pest before it becomes wide-spread in this area which contain many endemic species. Goldyn, B., et al., 2017. 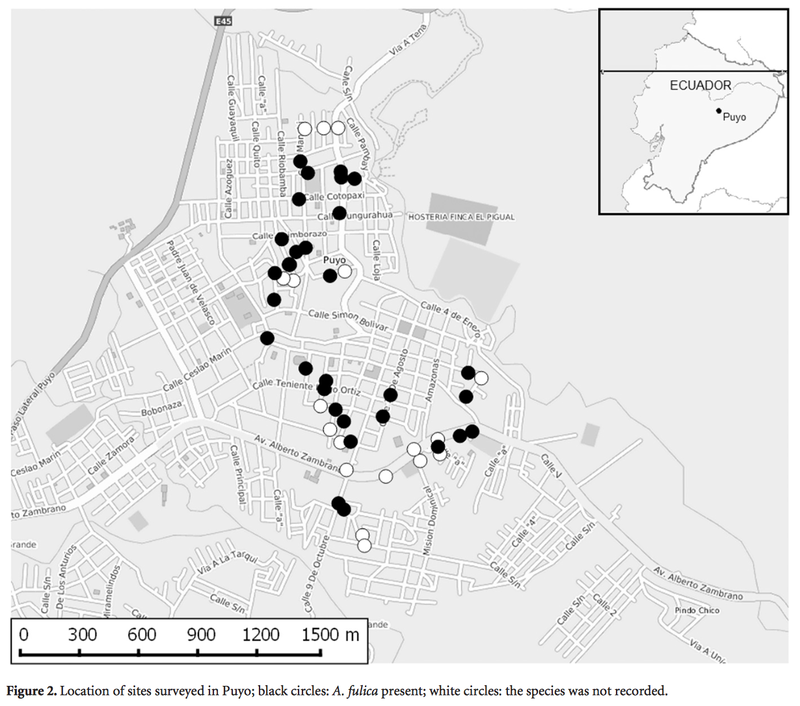 Urban ecology of invasive giant African snail Achatina fulica (Férussac) (Gastropoda: Achatinidae) on its first recorded sites in the Ecuadorian Amazon. – American Malacological Bulletin, 35: 59-64. This entry was posted in Uncategorized and tagged Achatina fulica, ecuador, invasive species, literature on May 23, 2017 by bramb.